Indiana Gov. Mike Pence says his No. 1 education priority for the 2014 session is funding a pre-K voucher program for low-income Hoosiers. Pence, who took office in 2013, spent his first legislative session focusing on jobs and the economy. At his urging, state lawmakers created Regional Works Councils and the Indiana Career Council. Now he’s shifting his attention to Indiana’s youngest students. He’s proposed a pre-K voucher program for low-income Hoosiers making less than 185 percent of the poverty level — roughly $43,000 for a family of four. But there’s been broad support for early learning in the past, and it wasn’t enough to pass even a small-scale pilot program. Pence’s predecessor, Mitch Daniels, spent his second term in office cultivating a reputation as an education governor. Like Daniels, Pence supports school choice — he called for charter school innovation in his campaign literature — and has endorsed the state’s third grade reading exam. He’s also in favor of merit pay for effective teachers. But while Daniels had the support of then-superintendent Tony Bennett, Pence has found himself at odds with Glenda Ritz, the Democrat now running the Department of Education. When Pence announced the creation of a new education agency to house his workforce development efforts, Ritz cried foul. She says she was left out of the loop about the Center for Education and Career Innovation and has accused its staff of trying to undermine her department. Now Pence is at the center of a messy fight between Ritz and the other members of the State Board of Education, most of whom he appointed. 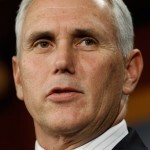 Previously, Pence served as U.S. Representative for Indiana’s 6th District and chaired the House Republican Conference. His lieutenant governor is Sue Ellspermann. StateImpact interviewed Pence in October 2012 — we’ve posted a transcript here. Five years after the state’s voucher program started, the structure and outcomes of the program have dramatically changed. Governor Mike Pence is the official Republican nominee for vice president, so we take a look at education policy during his tenure as governor. Gov. Mike Pence says he does not want a dip in ISTEP+ scores to affect teacher bonuses and evaluations, a departure from what he has advocated in the past. Pence is adding $3.5 million back into a program for which lawmakers slashed funding during session earlier this year. If Glenda Ritz Runs For Governor, What Are Her Chances? If Glenda Ritz enters the race for governor, she’ll have to campaign differently than her run for state superintendent in 2012.